1. The Marqueen Hotel (Queen Anne). I walk by this hotel all of the time and finally made myself walk into the lobby this week. I always get a sort of dark, dreary and “full house” vibe when I pass this place (full of ghosts?). When I did force myself to walk in, I was welcomed by two very nice gentlemen and this gorgeous winding staircase. I can see why people would haunt this former engineering school, built in 1918. It’s quite lovely. Some hotel guests mention a feeling of being watched. I can honestly say, the energy is quite dense, heavy if you will. Sit in one of the lobby chairs or wander the beautiful yet creepy hallways and judge for yourself. For an account of one guest’s stay, read this TripAdvisor report. 2. The Alibi Room (Post Alley). The pizza here is great. Just be weary of the “little girl” my friend swore she saw in the back booth corners of the bar or a cold whoosh of air that perpetually lingers on your lap (that little girl likes to sit on laps, apparently). The most famous ghost in Alibi is Frank, though- an elderly man who stands outside of the bathrooms and introduces himself. Post Alley, the street that Alibi sits on, is made up of cobblestones from the 1906 San Francisco earthquake. That might have something to do with it. 3. The Owl ‘n’ Thistle in (Pioneer Square) (Circa 1930). This place is full of spirits…brick, brass, books and beers. What more could you ask for, really? I love this cozy little pub. Apparently John Wayne and Robert Mitchum frequented this place, as well. But onto the ghosts and there are many. Apparently the staff at the Owl ‘N Thistle has the pleasure of listening to paranormal piano playing, seeing dark shadowy figures, kitchenware that moves on its own, and the apparition of a woman wearing an antique wedding gown and veil. 4. The Sorrento Hotel & Fireside Lounge, First Hill. It’s beauty and elegance has lured guests in since 1905. It provides yet another lovely spot I want to spend countless hours in with a book- The Fireside Lounge. It’s the fourth floor that’s haunted, though, so rent a room (#408) to find your supernatural experience. Find a review of their cafe here. 5. The Merchant Cafe and Saloon, Pioneer Square. This place is so haunted, it’s been on “Dead Files.” Ask Darcy, the owner, about the little girl that haunts the place and the doll someone left for her. There are too many ghosts here to mention and apparently after the “Dead Files” held an exorcism here, the ghost activity picked up. Read this for the history of the building and this blog post for a personal account of a gentleman’s experience there. I can honestly say, it’s the most haunted place I’ve experienced in Seattle. 6. The Moore Hotel & Theater, downtown Seattle (circa 1907). All sorts of ghosts and happenings have been reported in the hotel and in the theater. Ghostly cigar smells come from chairs (Mr. Moore?) as well as the feeling of “being watched” in various rooms. Previous actors an actresses of the Theater seem to still be hanging around, as well. Apparently Kurt Cobain had a drug overdose here. 7. Kells Irish Bar & Restaurant. (Post Alley) Ghost Hunters shot an episode here. It was a former mortuary as well as an Indian burial ground-the perfect combo. There’s a variety of ghosts here, apparently, including a little girl. You can view part of the Ghost Hunter’s episode here. Personally, I haven’t experienced anything here but I’ve spent most of my time on the outdoor patio and in the main bar area. Another friend of mine swears she saw a man standing in front of our table. I was too busy drinking my cider to notice, apparently. Here’s another video report of Kell’s that Seattle’s local news KOMO4 aired. 8. Harvard Exit Theater (Capitol Hill). circa 1925. This building was originally used as a meeting place for The Woman’s Century Club. Today, the theater currently shows independent and foreign films, the Seattle International Film Festival, and the Lesbian and Gay Film Festival. Apparently, laughter echoes throughout the theater and apparitions of women dressed in early 1900’s style clothing are seen on the third floor. At least the ghosts seem to be having a good time. Typical theater folk. 9. All of Pioneer Square and underneath it. 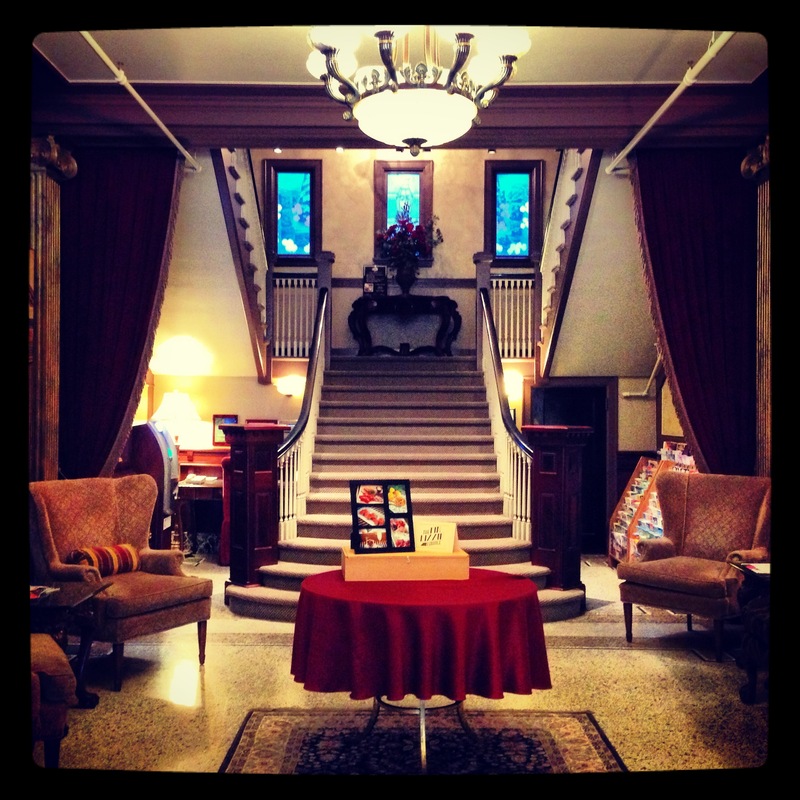 Spooked in Seattle Tours takes you through the oldest neighborhood in Seattle, stopping off at the most haunted spots like The Pioneer Hotel (formerly Yesler Hotel). This tour is led by real ghost hunters and is highly rated on TripAdvisor & Yelp. The tour headquarters is a spectacularly spooky space in the original Seattle underground that they claim is haunted, fully equipped with haunted, creepy dolls and caskets. Tour prices vary according to the tour but the walking tour is $16 for adults and $12 for kids up to twelve. After you finish that tour, though, you might want to take The Underground Tour, which my husband and I both enjoyed because it gave a thorough history and literal view of historical Seattle (take the night tour-it talks more of how the city was founded on prostitution). 10. Pike Place Market. Market Tour. Pike Place Market, established in 1907, is Seattle’s oldest farmer’s market…and it’s one of Seattle’s most haunted spots. By day, it’s hustling and bustling and not very scary. At night, the market takes on another personality and completely different energy. Yes, it’s on an old Indian burial ground. Yes, there is a ghost of an Indian…amongst many others. The Market Tour group gives a thorough after hours tour for $16.50. And for those non-believers out there, here’s Dave Grohl telling a story of his ghostly experiences in his former Seattle home. See, even rockstars see ghosts. All the cool kids are doing it. Posted on October 23, 2013 by triciachatter. This entry was posted in Events, Places, Tricia Chatter and tagged #hauntedplacesandspaces, #hauntedseattle, #merchantcafe, #merchantcafeandsaloon, #pikeplacemarket, #spookedinseattle, #whattodoonhalloween, Alibi Room, alibiroom, happy halloween, Haunted Seattle, Marqueen Hotel, marqueenhotel, Merchant Cafe and Saloon, mooretheatere, Pike Place Market, seattle, spooksinseattle, the moore theater, the underground tour, undergroundtour, what to do on halloween. Bookmark the permalink.